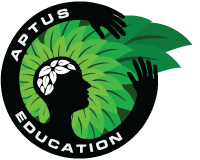 Aptus aims to educate and bring awareness. We think it is important that people are aware of the food they eat, and how it was cultivated. Once they get an idea of how crops are cultivated traditionally we are there to offer them the alternative. A way to work with nature. A way to grow your own clean produce without the use of harmful chemicals, heavy metals, chloride and ballast salts. Apart from lectures and seminars we are building an online repository of educational information here that can be applied in your own garden or indoor grow. If you still have questions after going through that, please don’t hesitate to send us a message!